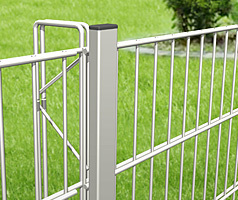 The polished post-grilles construction makes it possible: The grilles are firmly and securely connected to the post with just one bolting on each post. 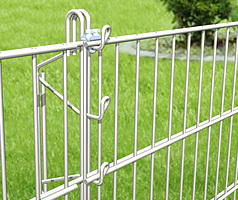 In this way, dozens of metres of fencing can be installed within a short period of time. At the same time, the system only requires a minimal number of parts. The lightweight design is unobtrusive and visually restrained and lets your property, terrain or architecture take effect. The clamping pipe is connected to the wire hook and therefore allows a smooth finish outward without compromising its basic properties. Perhaps the most popular system overall. 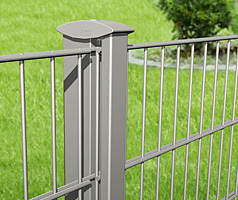 The bolting at the upper edge of the post is a structural element and a crowning finish at the same time.